Articulated Male Counter Top Dummy comes with a wooden cap. Head for this dummy can be purchased separately. Shoulder 480mm, Chest 960mm (38"), Waist 820mm, Hip 870mm, Arm 740mm. Body Height with Cap 680mm. Head Height 230mm. Base height is adjustable from 300mm to 730mm. Diameter of base 290mm, Thickness of base 30mm. 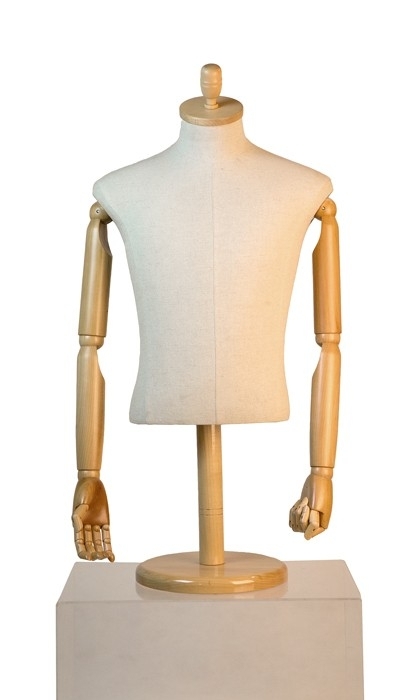 Articulated Male Counter Top Dummy comes with a wooden cap. Head for this dummy can be purchased separately.